A tea blend designed to soothe the stomach and keep it functioning optimally! Stomach Wellness tea combines ginger, chamomile, peppermint, rooibos and lemon grass-- all stomach-friendly flavors and herbs. Ginger, chamomile and peppermint are all known to quell upset stomachs, and lemon grass has helped me personally. Plus, it tastes great! So, try this tea to tame your tummy. I hope it works as well for you as it has for me! 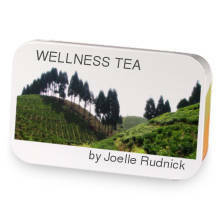 Stomach Wellness Tea has hooked up with WELLNESS TEA.